The Quicklink Talkback app is essential for the journalist who wants to become more flexible and mobile in the field. With its easy interface and touch screen options you can to connect to your Quicklink Playout Server for single Talkback, or purchase the additional software or Talkback Server that will guarantee you 12 extra channels of talkback. The app allows a simple selection by a button press of Anchor / IFB Audio, allowing you to negotiate between multiple accounts. 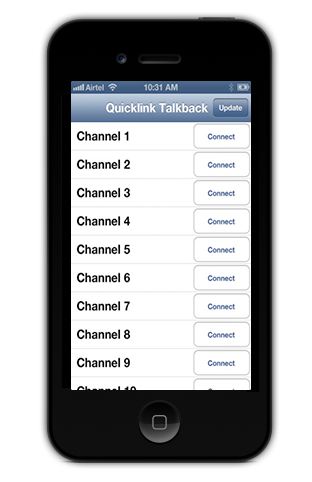 Designed to tie in with Quicklink’s range of broadcast tools, the Quicklink IFB Talkback application is a good fit for the TV broadcast industry, as well as dozens of other uses in government, military, CCTV, emergency services, NGO’s and others. A complimentary product to the Quicklink Media Manager, that allows the MCR (Main Control Room) the ability to completely control remotely the workflow of all field based reporters. Want more information about the Talkback App?